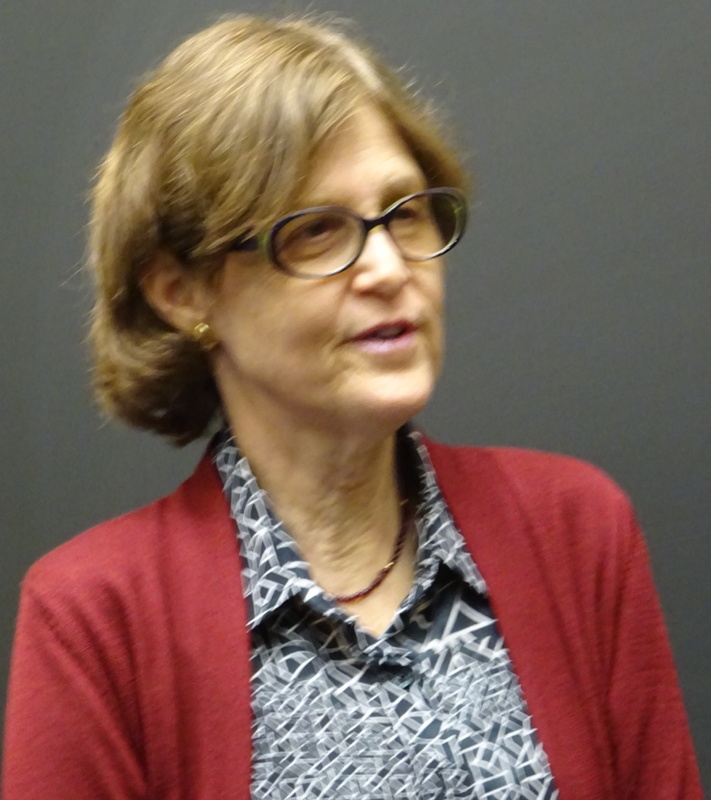 Dr. Michele Valerie Ronnick visited Trinity to deliver the annual Moore Lecture, which is intended to support the offerings in the ancient Greek language that the department of Classics offers. 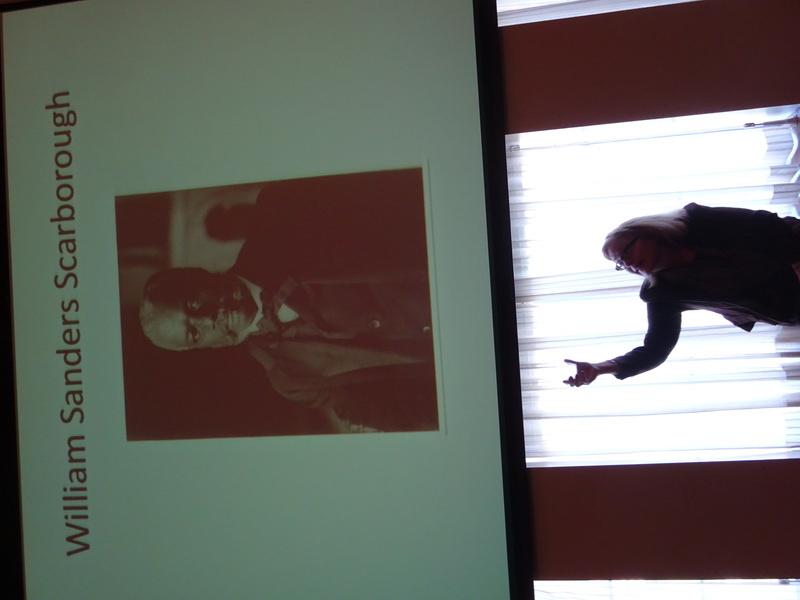 Dr. Ronnick presented the many years of research that she’s done on African-Americans who studied ancient Greek in the late nineteenth century. 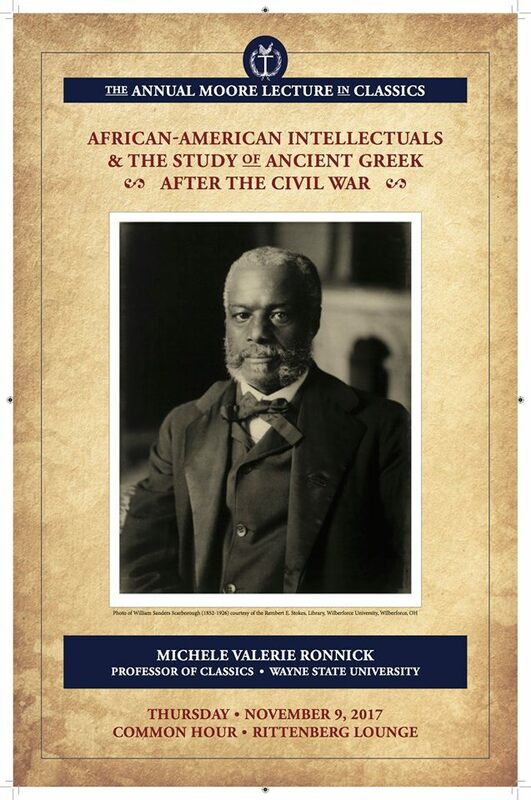 Among the individuals that Dr. Ronnick discussed, William Sanders Scarborough is prominent. The first African-American member of the MLA (Modern Languages Association) and the third of the American Philological Association (now the SCS, the Society for Classical Studies), Scarborough was a model classicist, presenting several times at annual conferences on subjects as traditional as the grammar of a Greek text and as boundary-pushing as the reception of the Roman playwright Seneca by the French playwright Racine. Dr. Caldwell recorded the lecture, and it’s now available on YouTube. Thank you, Dr. Ronnick, for visiting us and for sharing your important research on this important aspect of the discipline of classics! On November 13 2017, Dr. Emily Katz Anhalt of Sarah Lawrence College spoke to us about violent Greek myths and their importance for our society today. 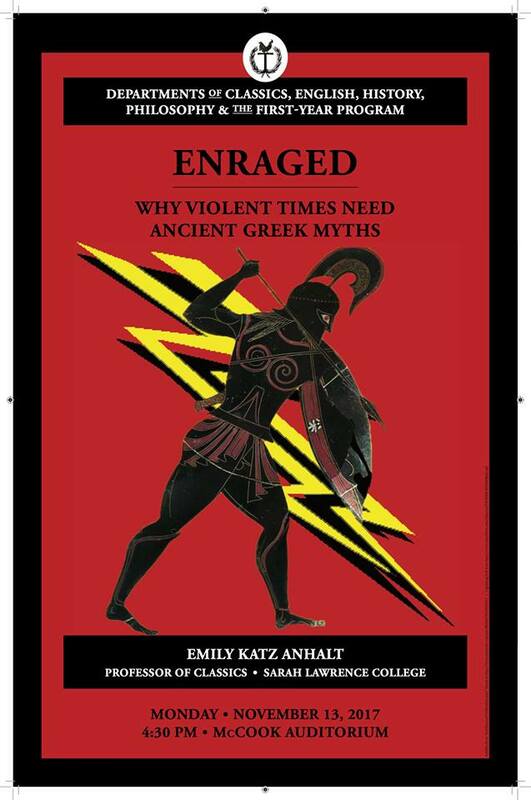 Her 2017 book Enraged: Why Violent Times Need Greek Myths (Yale University Press), Anhalt re-tells and interprets stories from Homer’s Iliad, Sophocles’ tragedy Ajax, and Euripides’ tragedy Hecuba. She argues that these stories show the heavy tolls of violent behavior and led to the creation of democratic ideas in ancient Greece. The ancient Greeks represented the destructiveness of violent behavior to remind themselves of the danger inherent in that kind of attitude. But, Anhalt claims, our current attitude is very different. She points to the violent behavior that is the norm in modern media and the arrogance displayed on social media. Ancient Greece could solve our problems! Dr. Caldwell recorded the lecture and it’s now available on YouTube. Thank you for visiting us and sharing your insights about ancient and modern times, Dr. Anhalt. Her book is very readable and relatable: get it at Amazon or your favorite local bookseller! The Film & History conference is an annual gathering of scholars who present the latest in research on the intersection of film and history. 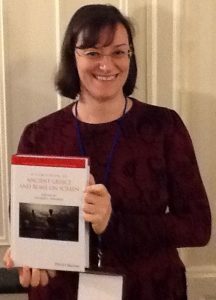 For several years now, Trinity Classics professors Dr. Meredith Safran and Dr. Vincent Tomasso have attended the conference and presented their work. In addition to giving talks, for the last three years Dr. Safran has also organized the classical antiquity area, a thematically-linked set of panels that typically number around 10! The theme for this year’s conference was “home.” Dr. Safran examined this theme in Virgil’s epic poem the Aeneid and in the science-fiction television series Battlestar Galactica. She argued that both Aeneas’ Trojans and Battlestar Galactica‘s Colonials must deal with the destruction of their homes in ways that reveal continuities between the two narratives. We’re looking forward to hearing more about Dr. Safran’s ideas when her book about the Aeneid and Battlestar Galactica is published soon! Dr. Tomasso used the theme of “home” to examine how the 2017 film Wonder Woman erases the title character’s connections to the United States. Dr. Tomasso demonstrated how these links were prominent and explicit in the 1941 version of Wonder Woman, as well as how the film went out of its way to problematize American identity. 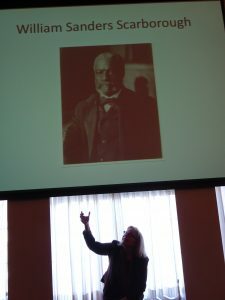 Dr. Tomasso connected these changes to evolving ideas about the United States’ connection with classical antiquity. Every year, publishers set up a table at the conference with books about the subject area available for purchase. This year, A Companion to Ancient Greece and Rome on Screen (Blackwell 2017) was available. 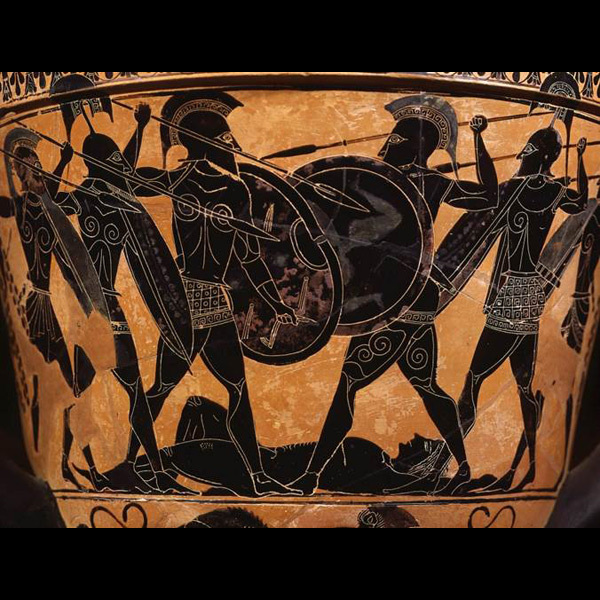 Dr. Safran has written a chapter for that book, entitled, “Greek Tragedy as Theater in Screen Media,” which examines how films adapt ancient Greek tragedies, such as Julie Taymor’s 1992 film version of Sophocles’ fifth-century BCE Oedipus the King. So long for now, Wisconsin! See you next year! Trinity Classics at Film & History 2017! 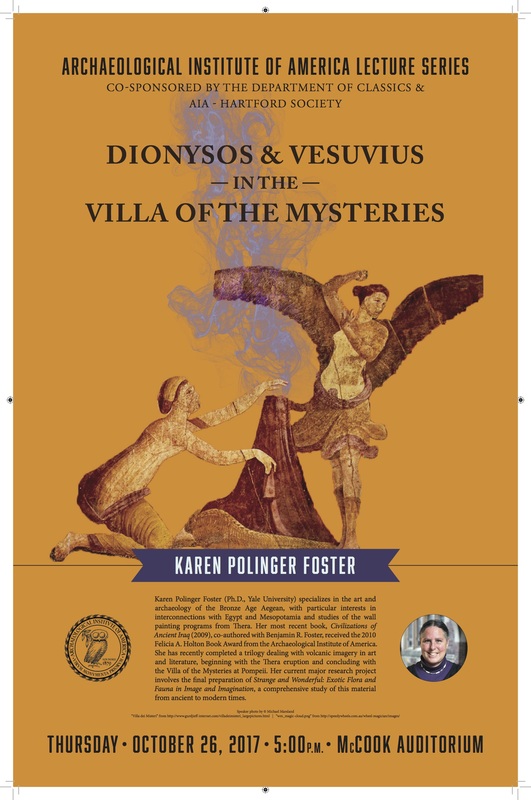 Her subject was a fresco on a wall in a house in the ruined Roman city of Pompeii. The common interpretation of that painting was that the figures are engaging in rituals related to the mystery cult of the god Dionsysus. The triangular shape between the two female figured had been interpreted as male genitalia, with the winged female figure on the right expressing shock. Dr. Foster, however, re-interpreted the scene. She visited Pompeii and drew the scene herself. She now argues that the triangular shape is a cone of incense rather than a phallus. Both students and community members enjoyed Dr. Foster’s dynamic lecture, which was held on the Trinity College campus in the McCook Building. This entry was posted in Uncategorized on November 10, 2017 by vtomasso.